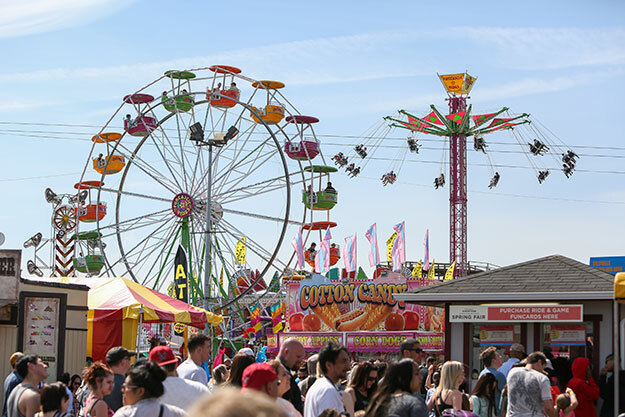 The Washington State Spring Fair at the Puyallup Fairgrounds is a great time to shake off the rainy grey of winter as the lightness and color of spring approaches. "Family is truly what Spring Fair is all about, from the types of programming to the duck mascot named Quigley," said Stacy Van Horne, public relations manager of the Washington State Fair Events Center. Quigley the Duck, who can be found near the Gold Gate Fountain, is 20-feet tall, enjoys eating cotton candy and listening to the song "Walking on Sunshine." "We want our guests to think of the Spring Fair as the ultimate celebration of spring; it's a time and place to celebrate the start of the season; and it is the biggest celebration of spring in the state!" Unlike the State Fair held at the end of summer, the Spring Fair emphasizes family-oriented activities and exhibits that younger children may enjoy. To the 150,000-plus anticipated visitors, this spring's extravaganza is replete with animals, Future Farmers of America (FFA) displays, 4-H contest, a SlamFest Demolition Derby, a Monster Truck Show, racing pigs, a Garden Show, Auto Alley, a Kidzone, numerous vendors, rides, fair food and many memories. "This is a great time of the year to come out and celebrate the beginning of spring with the whole family," concluded Van Horne. "We hope to see everyone to help us kick off this wonderful event!" Friday, April 12, is Military Appreciation Day. With valid military ID, free gate admission is offered to active-duty, retired, disabled and reserve military members and their dependents. Quigley will be waiting to welcome you.